From the name, it is easy to understand that AOMEI PXE Boot is a tool for PXE booting. PXE means Preboot Execute Environment. This technology is to create such an environment to boot multiple computers in the same LAN through a network without disk and other media like USB, CD/DVD, etc. AOMEI PXE Boot is such a tool designed to boot many machines from a micro system in a network. Broadly speaking, install AOMEI PXE Boot on the server computer, then control and boot other client computers. How to use AOMEI PXE Boot? Traditionally, you can create a micro system with a third party tool. When choosing AOMEI PXE Boot, we suggest you create the bootable Linux image or Windows PE image file with the tool offered by AOMEI Backupper(AOMEI PXE Boot is integrated into AOMEI Backupper, it is also a single program). Then you are able to use AOMEI PXE Boot Tool and make other clients or target computers boot from the micro system file. After booting, you can backup and restore or maintain a system with tools offered with Windows PE micro system. Using AOMEI PXE Boot is very easy, few steps. Download and launch it. You will see the interface as following picture shows. Select one of them to deploy images. If you are the first time to use AOMEI PXE Boot, select the above option will pop-up a window and let you install other free backup tools to create bootable media first. If you select the second option, a custom image file can be a Linux or a Windows PE micro-system file(an ISO or WIM format file). This is one of the advantages of AOMEI PXE Boot - strong compatibility. After choosing the boot source, click “Start Service” to go. Then you have to set boot sequence from BIOS on client computers, a network should be the first booting device if you plan to use PXE function. 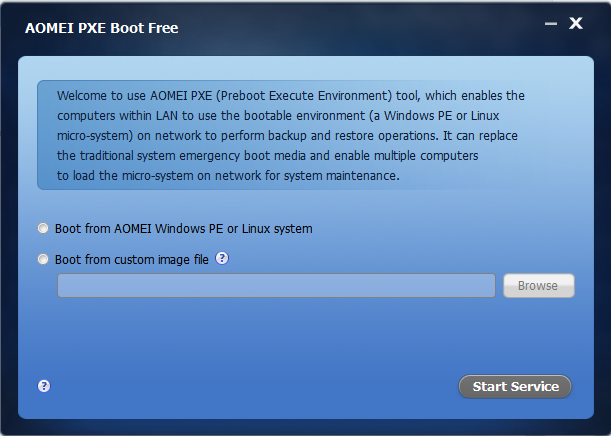 AOMEI PXE Boot is a freeware. Everyone can use it to build a PXE boot server quickly and simply. Nowadays, numbers of computers in a room is not something news. And most of them are bare metals, luckily, they are connecting to LAN. Thanks to AOMEI PXE Boot, you could boot, install, maintain the system on these computers at the same time. All in all, AOEMI PXE Boot does a great help.